What prompts an historical fiction/fantasy writer to want to see the Dior Exhibition? I often wonder how I got myself so deeply entrenched in the twelfth century. If one takes the TV or movie image of that era, it’s represented by mud, damp and ell upon ell of brown or taupe cloth which has been hastily cut and roughly sewn together to make tunics. (to e-book in the first instance, and then print) this is how the days progress. My chapters return from my editor in the UK in blocks of three. I make the necessary changes and save them to my master file. I have been so very lucky to date with this book – so far there have only been line-edits, no major structurals where I need to re-write pages. I don’t know if this is due to the fact that I wrote the book very slowly and really gave it a hard edit between each chapter as I transcribed from paper to computer. Plus another hard edit before I sent it to the editor. I do remember scrapping whole paras and pages as I wrote, until it flowed the way I wanted. So here’s hoping for the rest – yes, I am holding my breath. 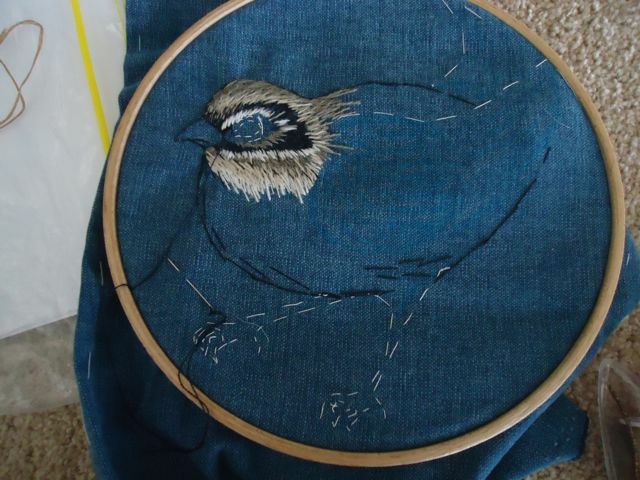 One blue cushion cover with bird (unfinished). 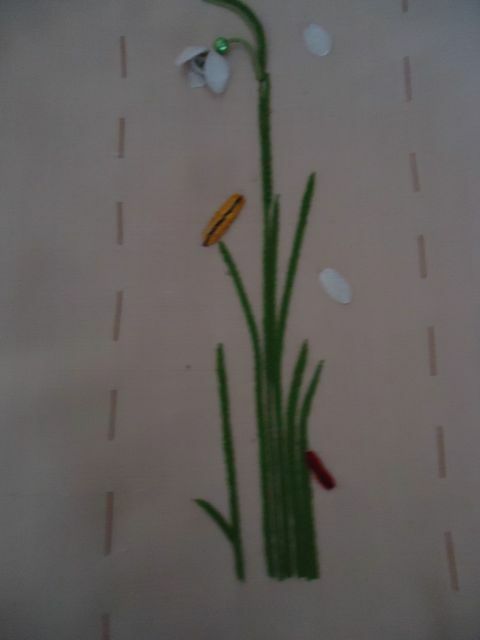 One stumpwork of snowdrops (almost finished. See below). I’ve known Jane Nicholas for a number of years since I met her when I enrolled in a ‘how to’ class for stumpwork at our local embroidery shop, A Stitch In Time. In the course of conversation, she found out that I was a book and paper-artist and our friendship developed on a number of levels because we have similar backgrounds and we both deal in forms of communication and creative expression. I felt the ringing of those kindred spirit bells, – a sure sign there is a good friendship in the offing. A stitch in time saves nine they say. A week ago, I attended a masterclass of stumpwork embroidery in a shop called A Stitch In Time. In fact I saved no stitches at all. I had hundreds of stitches to accomplish before the piece I was working on would be finished. A couple of days before Christmas, I went to the framers to collect my stumpwork medieval mirror. I could barely remember what I chose as a frame although I recall I didn’t want any sort of mount on the assumption that the embroidery itself would form a border to the mirror which would rest in the very centre of the stitching.